Web archives are fast becoming the fundamental source with which the history of the Web is written. Scholars coming to them for the first time are in need of some orientation, however, since those archives are brought into being by many different organisations for varying purposes and by different means. Their scope and structure also vary widely, as do the means of first locating and then using them. 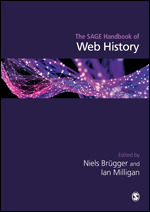 My chapter in the new Sage Handbook of Web History aims to provide just that orientation. It begins with a brief historical sketch of the development of Web archiving over the last 20 years, which I discussed at greater length here. It then moves on to outline the different means by which these archives are created, and what implications those differences have for how they must be interpreted. It outlines the varied kinds of collections in existence, and the different questions of method that this variety raises for scholars. Finally, it details the means by which scholars may first locate archived Web content, and (once located) how it may be used. Along the way, it raises several points of necessary critical engagement for Web historians regarding the archived Web as a new class of primary source. Some of these issues have their analogues in print, manuscript or other sources; a scholar needs to understand who produced an object, whether it be a book, a manuscript, a painting or a PDF. But some of the issues presented here are peculiar to the archived Web, and must be thought through afresh. The technologies that are used to create archived Web resources fundamentally shape those resources, and so understanding those technologies is a prerequisite to understanding the archive. Crucial also is an understanding of how the archive is structured: along national lines, by the institution or sector that created the content, by format or by a more general subject.